Like a fine wine ready to pour, these are the moments to savor; these are the memories you’ll cherish. Come create your moments. A tribute to the God of Wine, Bacchus is designed for the ultimate charter vacation. Beautifully refit and luxuriously appointed, this 146-foot yacht is fully equipped to inspire the vacation of a lifetime. 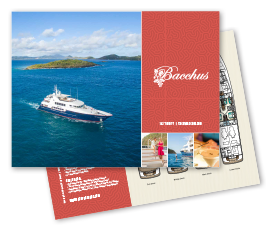 Step aboard Bacchus and enter a world of romance, adventure, celebration and relaxation. Named for the God of Wine, Bacchus embraces her guests in sumptuous surroundings where every whim is catered to by attentive and professional crew. Extensively refit in 2016, the Bacchus swim platform was extended by 4 ft and collapsible stairs were fabricated with sturdy stainless handrails, leading into the water and maximizing the fun allowing for easy entry and retreat from the ocean. Built by Trinity Yachts in 2005, Bacchus was refit in 2015 incorporating a rich and luxurious interior conceived by Ari Loar of Ari Loar Interiors. An extensive refit completed in 2016 included a new sundeck and 4-ft swim platform extension. Bacchus sleeps up to 12 guests in five ensuite staterooms. Bacchus is equipped with the latest in audio/visual and entertainment systems. An impressive complement of watertoys, fishing equipment and dive gear caters to adventure above and under the water, while an array of exercise equipment will keep the workout routine on track.